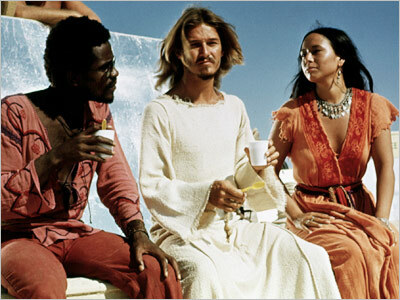 Jesus Christ Superstar: Who Do You Say I Am? 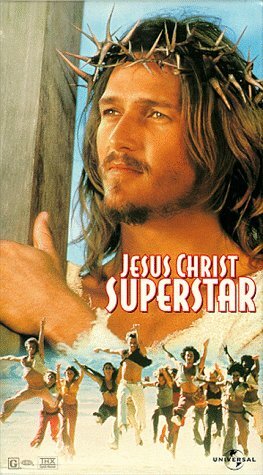 For me, the staple film of Holy Week is Jesus Christ Superstar . The first time I saw the film was in high school when VH1 was airing it on Palm Sunday. Being an early 1970’s rock opera, the movie seemed to be pure cheese to me. But the music was catchy, so I kept watching, and by the time Herod’s scene came, I was hooked. In fact, my senior year of high school, I tried to convince the woman who ran theater at my high school to let us do Jesus Christ Superstar because I wanted to play Herod (unfortunately, we ended up doing Joseph and the Amazing Technicolor Dreamcoat and I had to settle for Naphtali). In both cases, they recognize that Jesus “moves” them, that he even scares them. Yet both Mary and Judas want to say that he’s just a man, that there’s nothing obviously special about him…except the effect he has on them. In the film, they sing “he’s just a man” in such a way that they don’t seem convinced, recognizing that even if he is just a man, he’s not a man like any other. These lines take Jesus’ questions to his disciples and invert them. Rather than asking what others say and believe about Jesus, it asks Jesus whether he believes what they say about him. It asks whether his coming went the way it was supposed to, whether the prophesies were really fulfilled, and whether his sacrifice was worth it. And when the chorus and Judas’ lines are put together, the real question seems to become whether this divine plan was the best way to spread the message. The purpose of this inversion is not to get an answer out of Jesus, and the film never really pretends this is possible. Rather, what it does is drive us to think about these questions in a new way. In part, we are tasked with the perennial question of “who do we say Jesus is?” Is he just a projection of my own wishes and desires, my “own personal Jesus”? Or is he the savior and liberator who challenges me in my complacency, who mediates Gods’ grace to me as both “gift and threat” (to quote David Tracy)? And in another part, I think we are tasked with thinking about how we help to spread the message of God’s love for creation. The other day I posted a quote from Oscar Romero about how we as the Church are God’s microphone on earth. We are the ones called to lives of holiness, to loving God, our neighbor, and ourselves. Judas is right that mass communications didn’t exist in Jesus’ time, and yes there is much good that can come from working with the many gifts that modern technology has blessed us with. But the fundamental medium is ourselves. “At its most profound level, [communication] is the giving of self in love” (Communio et Progressio 11). As we approach the Triduum and look forward to celebrating the resurrection, I hope we can reflect on Christ’s communication of himself to creation, and how we in turn can communicate that to one another. Steve, thanks for your thoughtful reflections drawn from the music. My mom had me watch the film during Holy Week when I was in early high school, I think to encourage me to engage a bit more deeply. I loved it, and while today the cheese (and sometimes the theology) makes me squirm, I think you’re right that it can help us to ask good questions, and the contrast you draw between a Jesus that we can control versus a Jesus who shapes us is important. That’s part of why I always enjoyed reading Barth–his theology was such a bucket of cold water on my temptations to create an idolatrous Jesus. And now I know which songs will be in my head for the rest of Holy Week, so thanks for that, too.